The holiday rush is here and will be gone before you can say “Happy New Year”. It is so easy to get swept into the frenetic whirlwind of the season and miss the most important parts like spending quality time with family and friends as well as giving back to those in need. The RED team recognizes the importance of these opportunities and is making them a priority. Since the inception of our RED PACK™ (Power-full Acts of Compassion and Kindness™) Program, we discoveRED that not only do these giveback opportunities promote team bonding but they also foster a deep sense of well-being. From cleaning a beach to reading to dogs awaiting their forever homes, even the smallest act of compassion and kindness makes a difference. 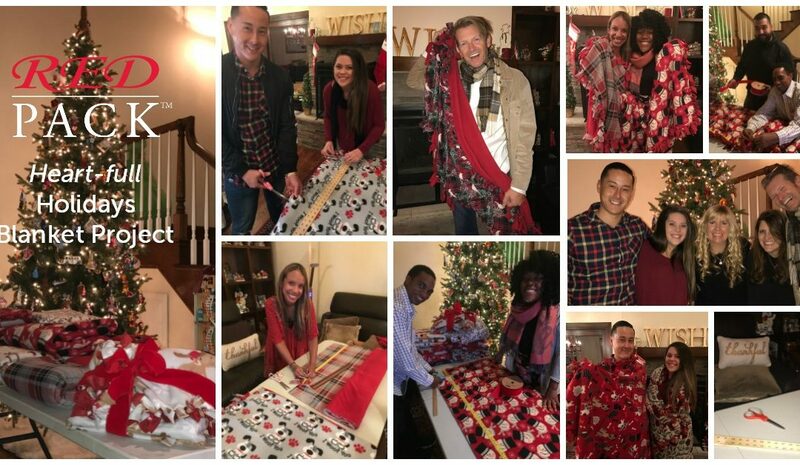 Last night the team took a few hours to enjoy a relaxing evening of holiday cheer, refreshments and camaraderie as we created No-Sew Fleece Blankets for our upcoming Holiday RED PACK™ community initiative. We loved this project because no matter our skill level, if we worked together, we were able to create ten beautiful blankets which will be donated to families whose children are facing life-threatening illnesses. Our hope is that these warm and cozy blankets will make the holidays a little brighter during a very tough time.